Posted on Friday, June 29th, 2018 at 9:15am . If you’ve ever looked up care package ideas for your service member, you’ve probably seen posts on “Open When” letters. While technology has certainly made it easier to communicate when apart, sometimes it's nice to get reminders from the people we love during times that they're not there. “Open When” letters give you the ability to spend a little time dedicated to making sure your loved one knows how you feel, that you support them, and that they are special. The best part about “Open When” letters is that they are not just for service members. The idea behind the letters is to write a bunch of them and mark them for when to open them. But service members aren’t the only people who need some words of support from time to time. Service members can write these for their spouse and children, kids can write them for their parents, or friends and family can pitch in to spread the love as well. 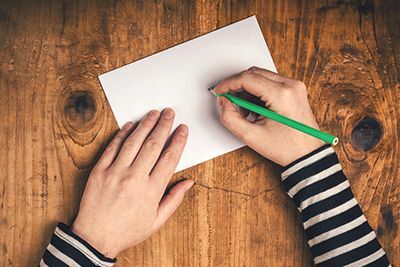 Here are some great ideas for “Open When” letters, but a quick Google search will generate more ideas than one person could write in a lifetime. Use these ideas and make them your own! Open when . . .
3. You’re having a bad day. 4. You’re having an amazing day. 5. You need some encouragement. 6. You’re mad about something. 7. You can’t wait to open another letter from me. 8. You can’t wait to come home/ have me home. 11. You need a laugh. 12. You need to be reminded of how special you are. 13. You need to read something hopeful. The topics you choose for “Open When” letters should reflect the personality of the recipient. They don’t need to be long (but they can be) and even if you’re not very creative, there are no shortages of inspiration online about what to say or special little things to include. One great idea for an “Open When You’re Frustrated” letter included slipping a little piece of bubble wrap in the envelope. Other spouses have made sure to use funny greeting cards to get a laugh out of their spouse, and encouragement letters can include inspirational or motivational quotes as well as a quick couple of lines lending support. “Open When” letters are an easy way to spend a few minutes now and create a new line of communication that is accessible even when one person isn’t. As a MilFam, it’s always worth taking the time to create memories and show gratitude to each other! Have you ever written a series of “Open When” letters? What was your favorite topic? Share with us in the comments!